Prime Minister Tony Blair has insisted that identity cards will form a "major plank" of the Labour Party manifesto at the next General Election. His pledge, which comes despite the fact he will step down before then, was made in his monthly news briefing. Mr Blair was responding to recent delays in the identity card scheme. He insisted ID cards were "a huge opportunity" and necessary to tackle immigration and crime. He added there was no doubt the scheme "goes forward". Leaked e-mails last month disclosed that civil servants had serious doubts about whether the scheme could be delivered. It then emerged there had been delays in putting some contracts out to tender. 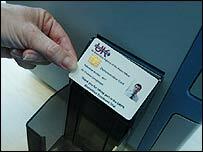 The government subsequently admitted that the ID card scheme may have to be postponed beyond its original 2008 launch date. But the prime minister told reporters they were wrong if they thought that the identity card scheme was being scrapped. He said: "We have a got a situation where we are going to have to have biometric visas for the US and for Europe - that will mean we have to have biometric passports." He said 80% of the UK population had passports, and it was "a huge opportunity, at the same time as you have to switch people into biometric passports, to have a biometric identity card that will include the passport on it". Mr Blair went on: "If people want to track illegal migration and organised crime in this country, you've got to have ID cards. Any other solution simply won't work." The Conservatives and Liberal Democrats oppose the scheme. Lib Dem home affairs spokeswoman, Lynne Featherstone, said: "The prime minister seems determined to push ahead with identity cards despite the growing body of opinion warning against their implementation... identity cards will cost a fortune and won't stop terrorism or fraud."